If you’ve hung out on our site for any length of time, you’ll quickly see that our family will make treats for any occasion. We always find reasons to celebrate life. Valentine’s day is no exception! 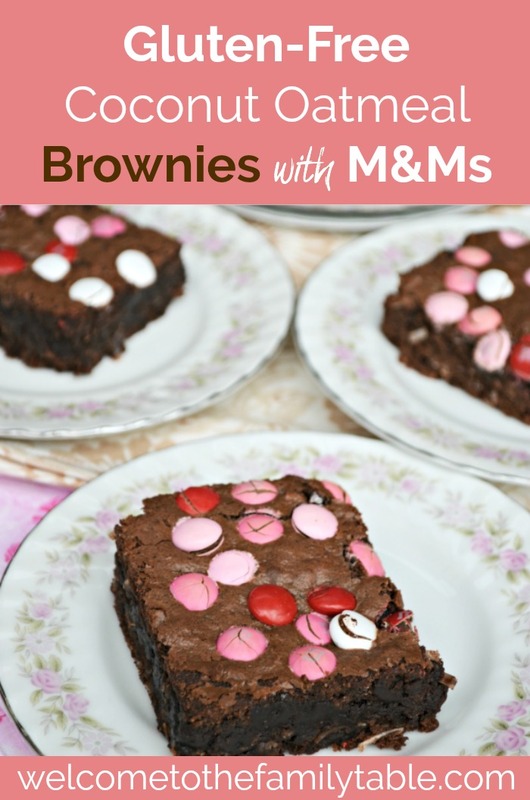 This semi-homemade coconut oatmeal M&M’s brownie recipe is perfect for Valentine’s Day or any day of the year. You could easily swap out the colors of the candy for St. Patrick’s Day, Easter, 4th of July, Halloween, Hanukkah, Christmas, and any other occasion you and your family see fit to celebrate. And the best part? It is super frugal AND easy to make! Are you a momma who needs to maximize her time? Or are you looking for a super easy recipe to make with your kiddos? Then this semi-homemade brownie recipe is perfect for you! You just take a standard box of brownies (any brand will do) and jazz it up a bit with a few extra ingredients, to make chocolaty brownie goodness that is sure to make your family smile. Make the brownies per the package instructions (normally requires eggs, oil and water). 1/3 cup M&M’s sprinkle them on top before baking. Mix up, pour in a pan and bake per box instructions. Make the brownies per the package instructions (requires 3 eggs + 1/2 cup melted butter). /3 cup M&M’s sprinkle them on top before baking.